This guide is designed to help you make the most of the GIS cloud and utilise all its features. Here you will find all you need to know at-a-glance to help you check for any problems with your network. • The Status box shows a list of your registered GIS units, their status and the group they are in (if any). Note: When red, this shows the unit has failed to check-in or is offline; these units will always be shown at the top of the table. • The Logins graph plots the numbers of logins. 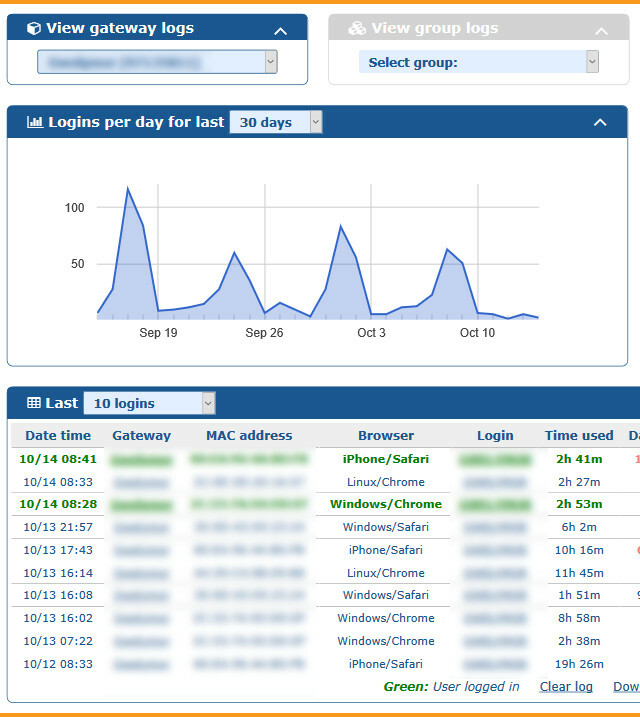 • The Logins table shows detailed information about the most recent logins. Clicking on a Gateway's name will take you the the Gateway page for this unit. When you first open this page you will see very little information. You first need to select one of your registered units from the dropdown menu (you will have at least 1). Once selected you will be able to view the gateway's Status, graphs showing the	Connected Users and WAN usage, list of Authenticated users and list of Connected users. You can also modify basic settings on this page and set allowed/blocked MAC addresses. 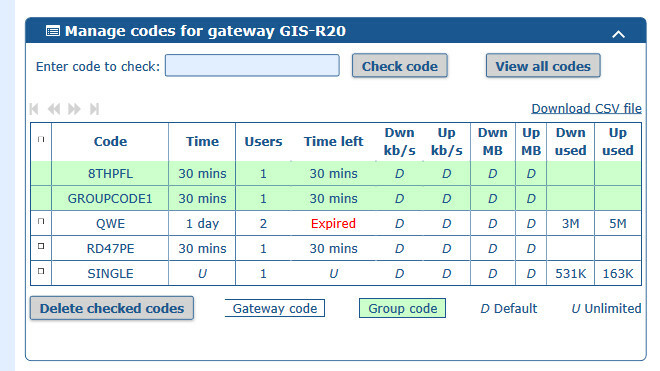 Allows you to change the name of your gateway and add your gateway into a group. It also shows the unit's uptime and whether it is currently enabled. If you have remote access enabled, you will be able to access the unit here using the spanner icon. Shows the Kbps up and down on your unit over time. The timeframe can be altered to show more or less information, and hovering over the graph will give you absolute values. 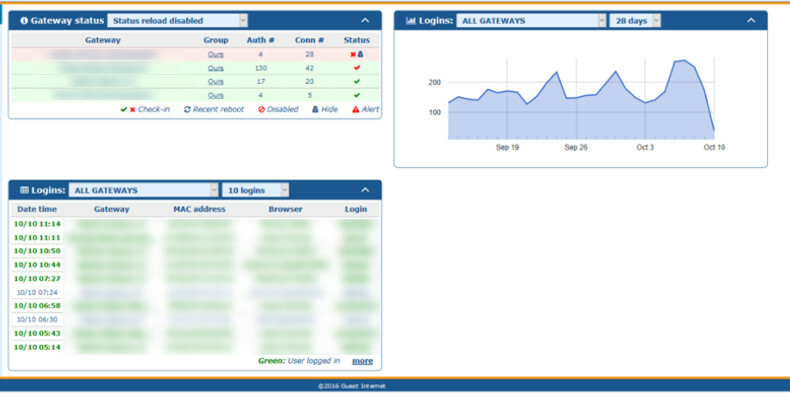 The Users graph shows the connected and authenticated users over time. 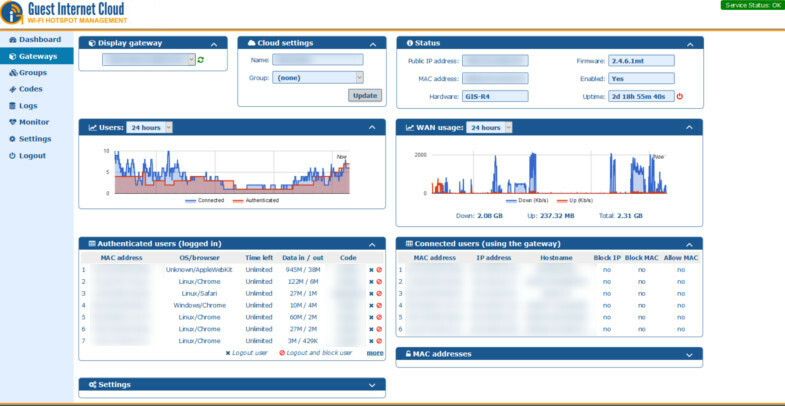 The Connected users table shows the MAC addresses, hostnames and assigned IP addresses of connected users. 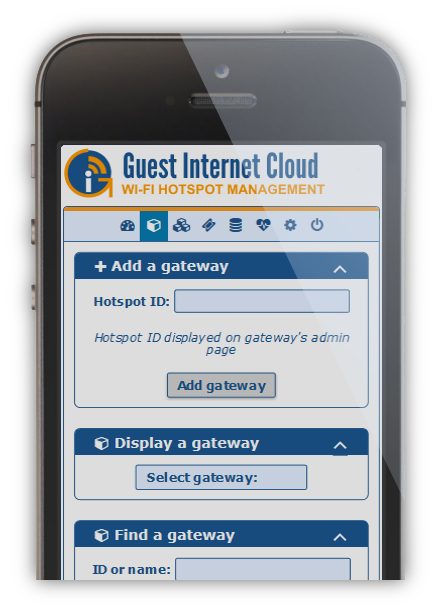 Authenticated users: Users who have logged in to the gateway and have access to the Internet. 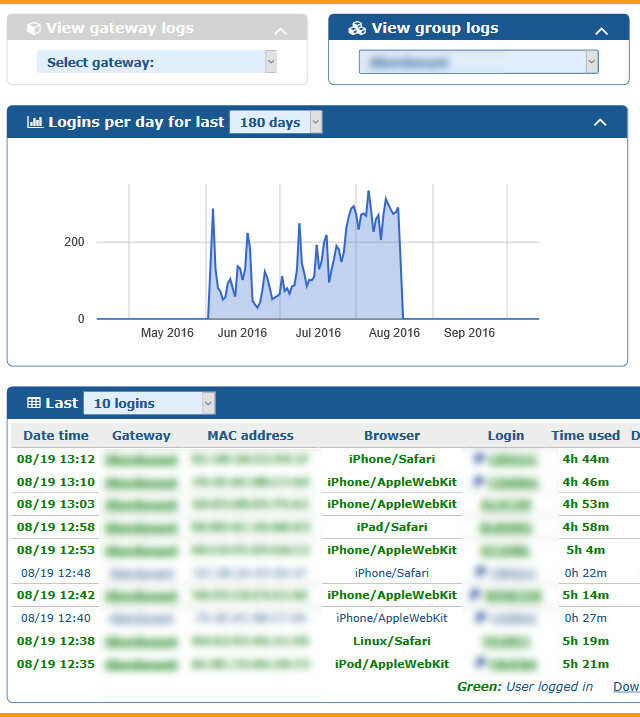 The Authenticated users table shows the MAC addresses, browser, time left, data up/down and code used to log in for each authenticated user. Here you can ban a user or log a user out. This shows the current Allowed MAC and Blocked MAC addresses. Allowed MACs allow a device to bypass the login page and have full Internet access at all times. Blocked MACs will prevent this device from logging in altogether. You can update this table and click the "update" button to edit this. Here you can edit basic settings on your unit. More settings will be added as the cloud is developed. Contact us if you need another setting adding. When you set up your account, the GIS unit you signed up with is automatically added to your account. 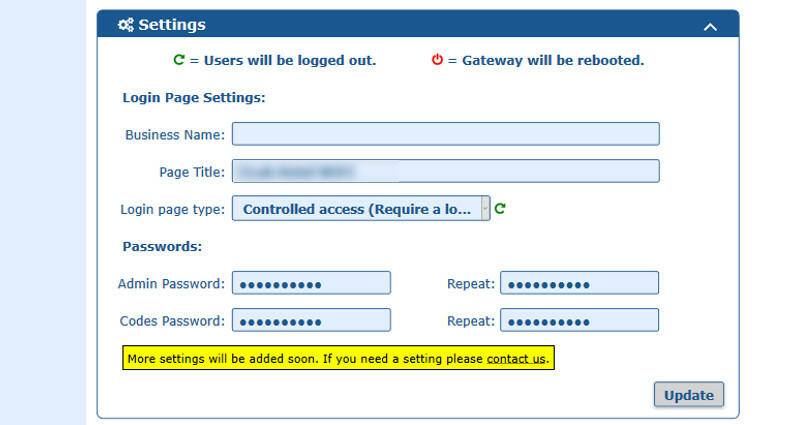 If you wish to add further units to your account, simply enter the ID of the unit into the "Add a Gateway" box, then click "Add gateway". 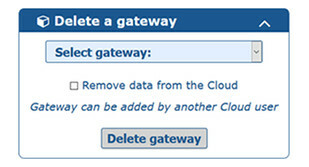 If you wish to remove a GIS unit from your Cloud account, on the Gateway page, under "Delete a Gateway", simply select the ID of the unit you wish to remove, and click "Delete Gateway"
With groups you can create codes to be used across multiple GIS units. Groups also allow for easier management and monitoring of multiple units. To use groups you must first create a group using a unique group name. You can create codes as usual for a single unit using the same method as on your local GIS admin interface. You can also select a group to create codes for. Group codes are created in the same way as individual gateway codes. On this page you monitor usage using the graph of past usage for a single unit or a group of units. The live monitor status shows any unit which is not currently checking in with the Cloud, and shows how long it has been down for. Tip: You can hover over the cross or tick under "Status" to see when the unit last checked in. 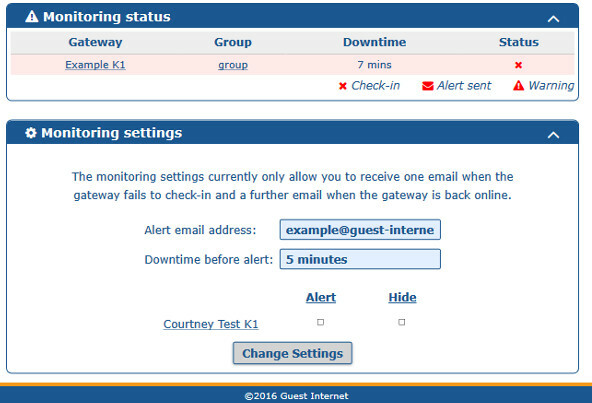 You can also create automatic email alerts, to let you know as soon as one of your units goes offline. When selected, if a unit does not check-in for 5 minutes and alert email will be sent to the address you signed up with. A second email will be sent when it comes back online. Next to each registered unit you will see a checkbox for both Alert and Hide options. When Alert is selected, an email alert will be sent if this unit goes offline. If hide is selected, this will remove it from the gateways page. This page allows you to change your password. Further settings may be added in future. If your unit is showing red on the dashboard or on the monitor page it means your unit is either offline or that it has not checked in with the cloud in over 5 minutes. If you see a red tick next to your unit, this means it has not checked in for over a minute, but below the 5 minute cut-off period to be shown as being offline. This would indicate a potential issue with the unit reporting to the cloud. In either of the above cases, this does not necessarily mean the unit is not working; just that it has not reported to the cloud. Potential causes are that either the unit has lost access to the Internet, has an error preventing it from contacting the cloud or that it is not working altogether. If your unit shows as being offline, you will need to investigate to find the cause. If the unit seems to be working correctly, but not reporting to the cloud, please contact us here. On mobiles and tablets, to maximise on available space, the menu will be moved to the top and will display Icons rather than text. The icons left to right are in the same order as top to bottom on the Desktop view. Q: How do I set up a new account? A: See the setup guide here. Q: How do I add another unit to my account? 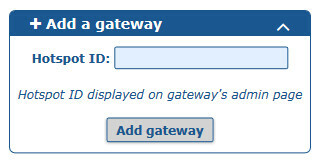 A: Simply enter your units ID into the "Add a gateway" box on the Gateways page. See here. Q: How do I create a code/group code? A: Codes are created in the same way as on your GIS unit's local admin pages. Select the code settings and click "create codes". This can be done on the codes page. See here.